Mix 8 ounces cream cheese, 4 ounces blue cheese crumbles and the 5 ounce jar of cheddar cheese spread. Form into a ball, wrap in plastic wrap and refrigerate for at least an hour. While that’s going on mix 1/4 cup cream cheese with orange gel food coloring until you achieve the color desired and thin with a tiny amount of water to make it about the consistency of toothpaste or slightly thicker. Place in a plastic bag or piping bag, snip a very tiny end of one corner of the bag. Pipe orange part onto 4 crackers first. (It’s best to actually pipe it onto a few spare crackers just in case any are not up to your satisfaction, or one might fall onto the floor). Now, cut that corner into a much larger opening and squeeze the cheese back into the bowl you used to stir in the orange dye. Now add red gel coloring to the cheese and repeat the previous process until you’ve piped on all three colors. It’s nice to start with the orange, so you don’t have to have 3 separate amounts in three bowls. Next, cut a sliver out of a red bell pepper that will become the head and neck of the turkey. When ball is done chilling, take out of the fridge, place it in the center of your serving platter (making sure you have room for your crackers), smooth it out if necessary and start adding the almond slivers as shown above. Place the red bell pepper for the head and neck. Pipe small dots onto pepper for eyes, insert the tail feathers with piped cheese into the back of the ball as seen in photo) and arrange crackers around the turkey cheese ball. I personally like these “Keebler Flip Side” crackers because the pretzel side that I pipe cheese onto for the tail feathers, stays crispy longer than the cracker side. 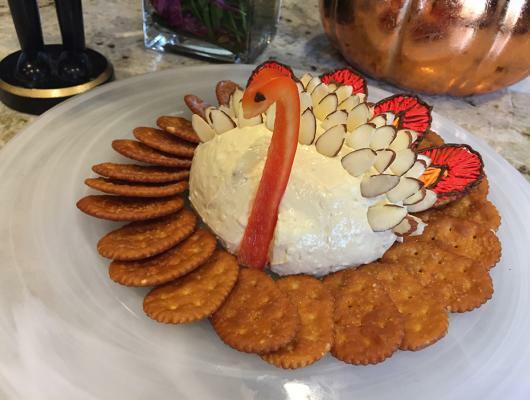 This super cute turkey cheese ball is sure to be a hit at your next Thanksgiving gathering, but you might have to be the first to dig in. People often think it’s too cute to eat and they don’t want to destroy your creation.